The older I get the harder it is to voluntarily choose flights that depart after 7am, but I didn’t have much of a choice for this one. The only options were this 6:40am departure, or one around mid-day which would get me home later in the evening. 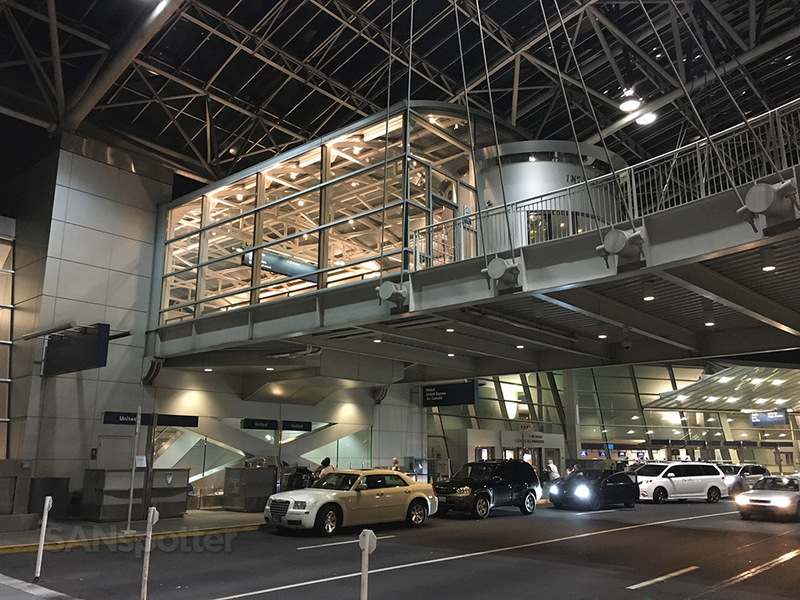 The decision to take the early flight was difficult, but ultimately necessitated by the fact that there was a long list of chores I needed to get done once I got home and I needed all the time I could get. Sitting around and doing nothing all day was simply not an option! 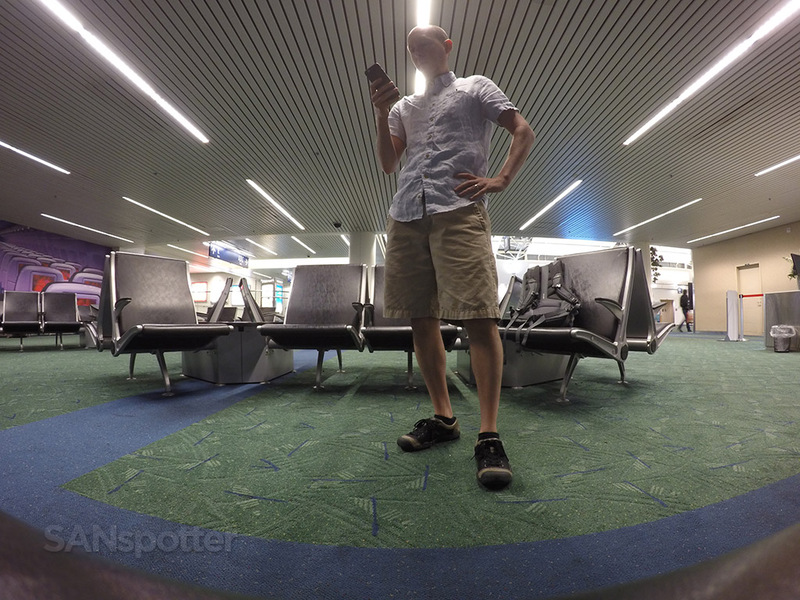 It’s been a long time since I’ve started a trip from PDX. 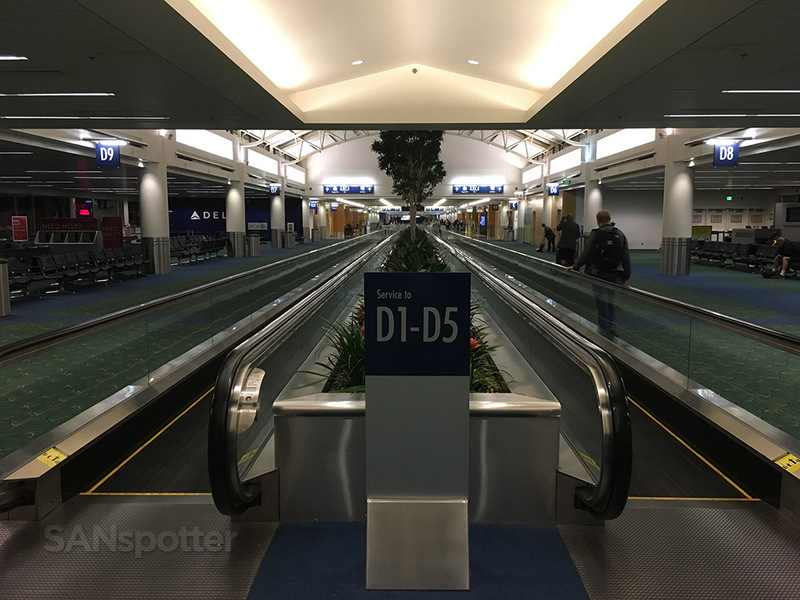 This is a good looking airport! 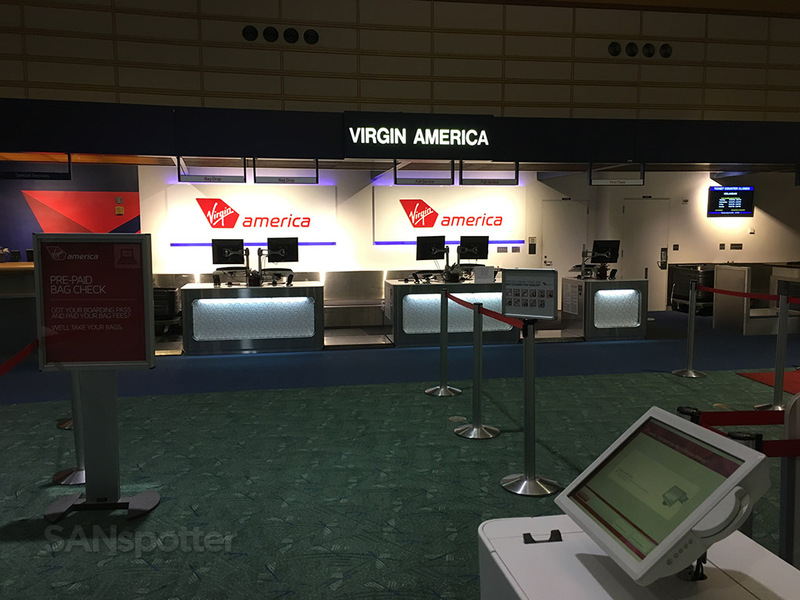 I thought for sure I’d be one of the first ones here this morning – but looks like there are some others with early flights as well. Walking through the airport trying to wake myself up. 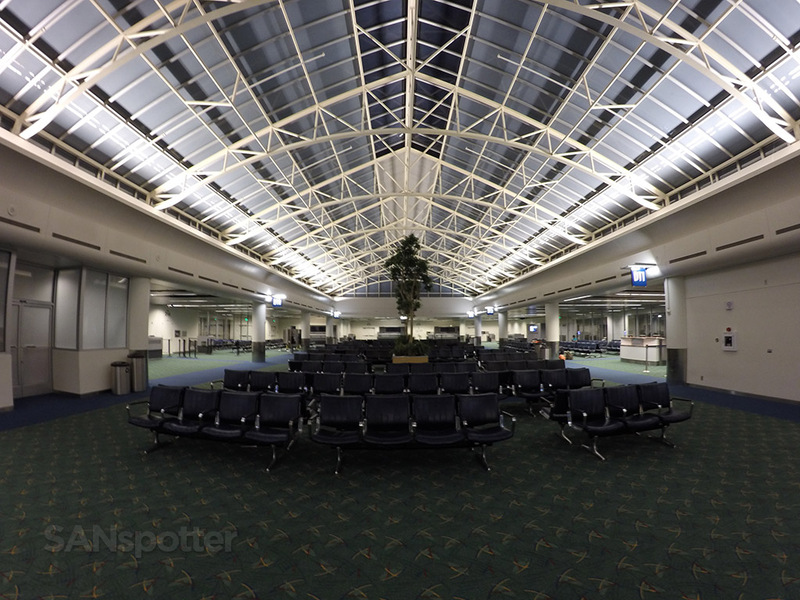 I love walking through empty airports and reliving old travel memories. 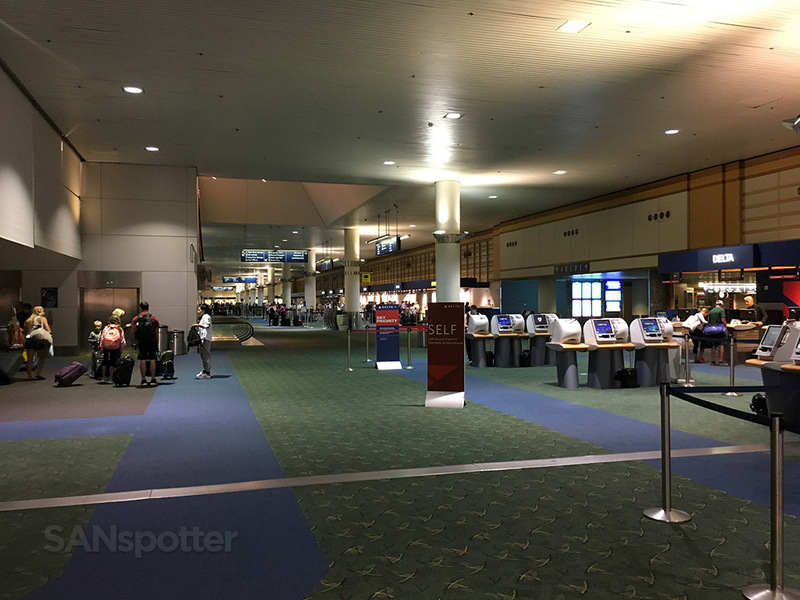 Back in August 2008 I sat here for a couple hours waiting to board a Northwest Airlines A330-200 to NRT. 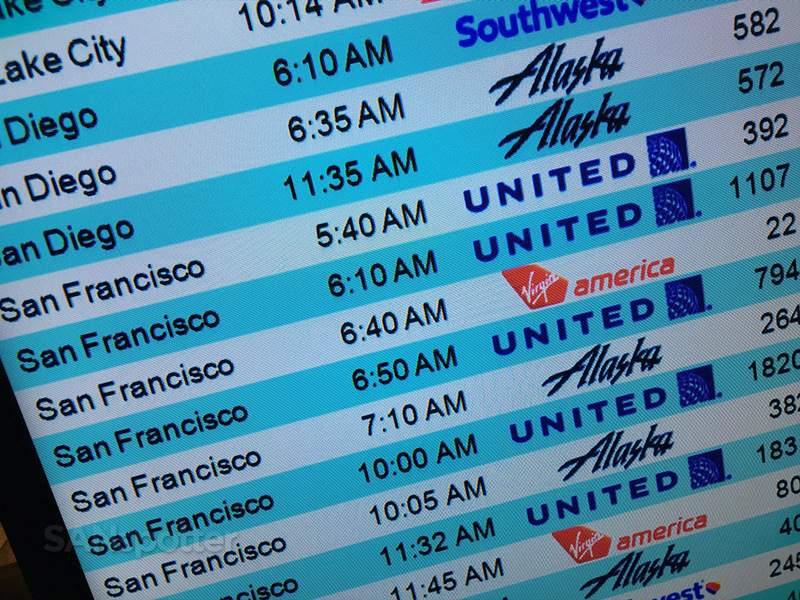 That 5:40am UA flight to SFO sounds downright brutal. Seeing that made me feel much better about my 6:40 VX flight! 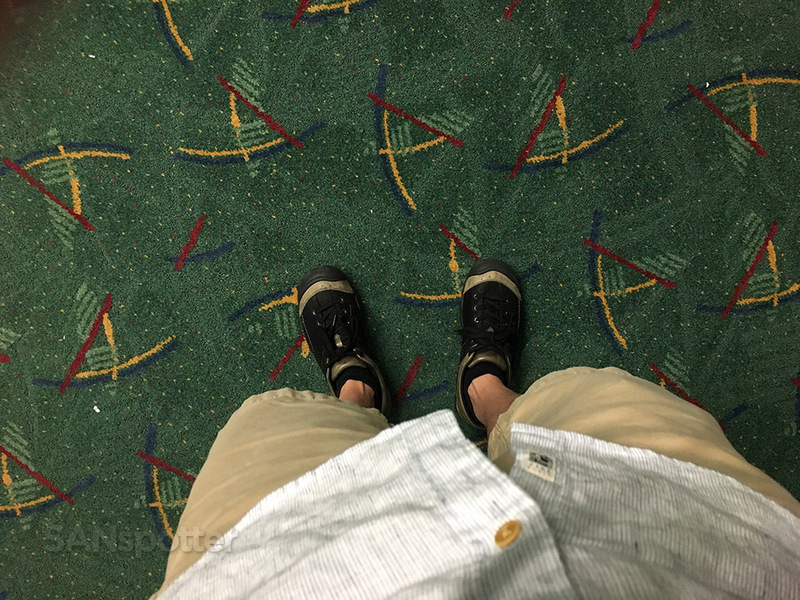 Perfect example of how the (in)famous green PDX carpet pretty much clashes with everything. 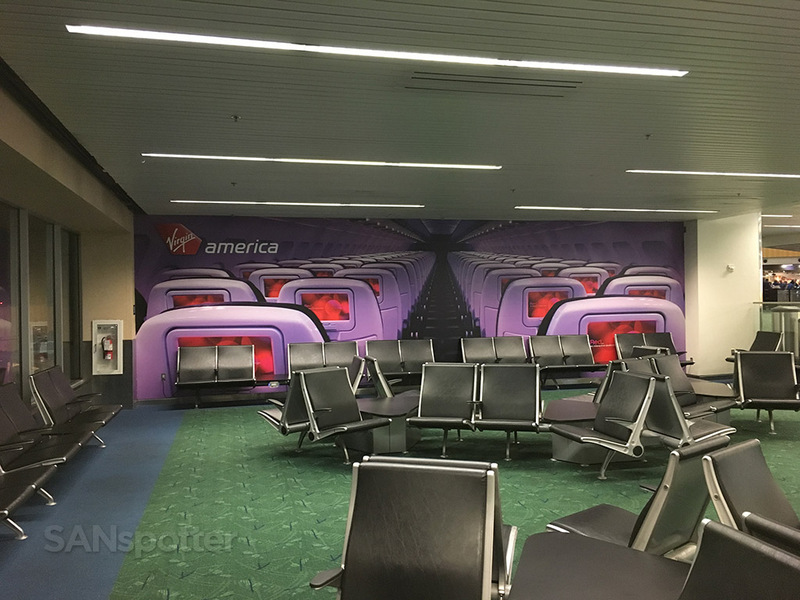 I do like the Virgin America murals on the walls of their dedicated gates at airports all over the country – much better than looking at plain eggshell-white walls IMHO. 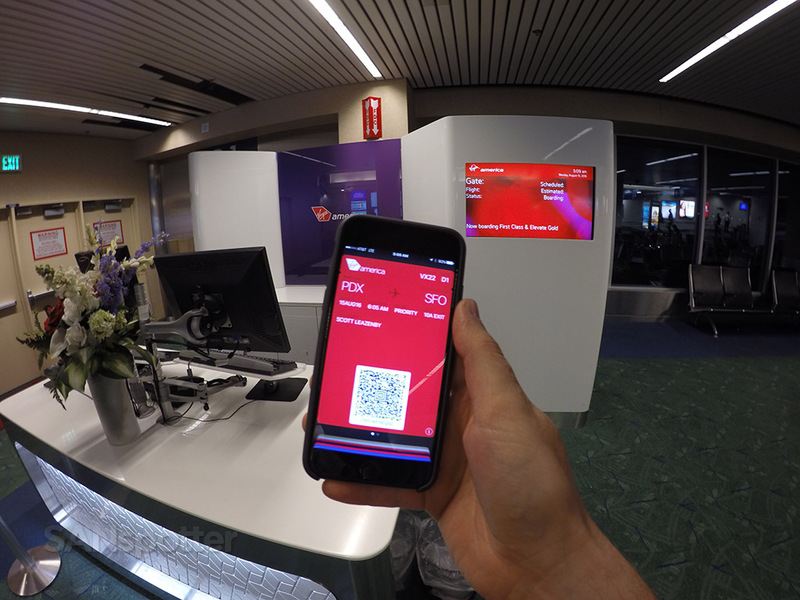 The Virgin America brand colors add a nice splash of life to the innards of PDX. 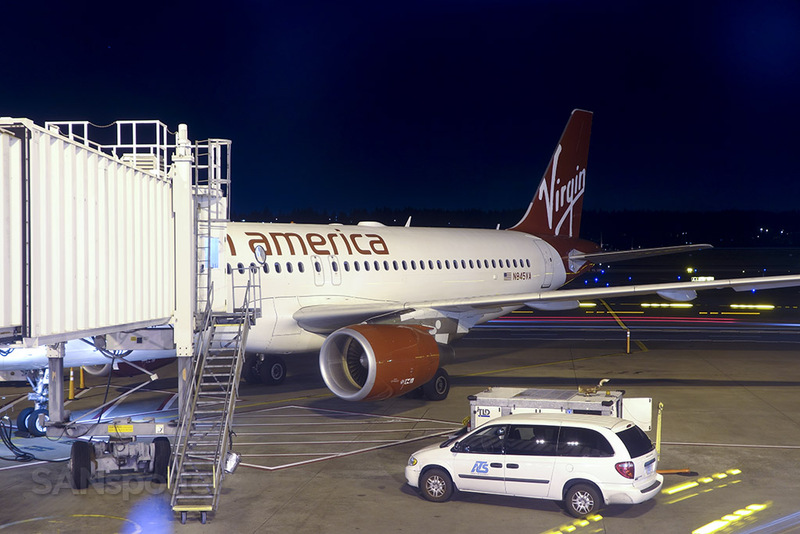 N845VA looking good parked at the gate just before sunrise. Sorry for the poor colors in this shot – the windows are heavily tinted and this was the best I could do. It was right about this time that I was hating myself for not sleeping in an extra hour before coming to the airport. I arrived way too early this morning! Just moments before boarding started. Everyone looks so full of energy, don’t they? 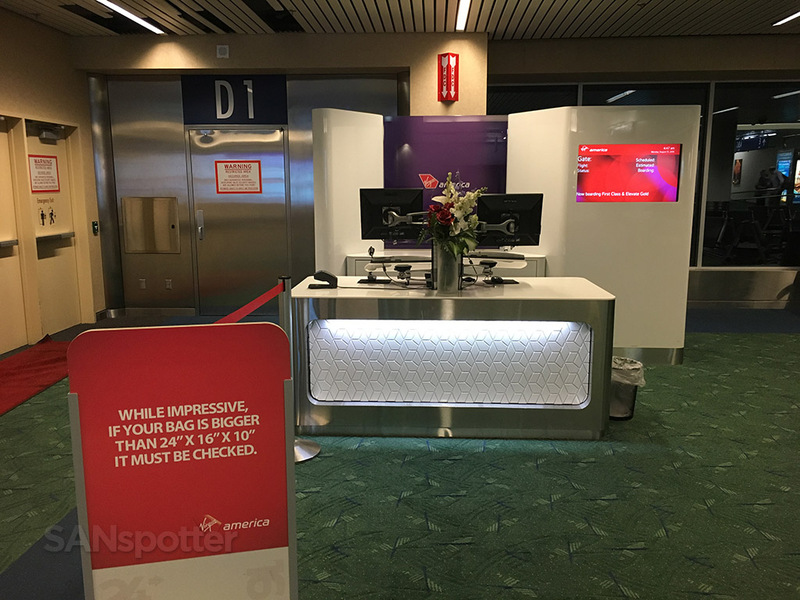 Now that I’ve experienced both first class and economy class on Virgin America, I was looking forward to giving their premium product (Main Cabin Select) at try. 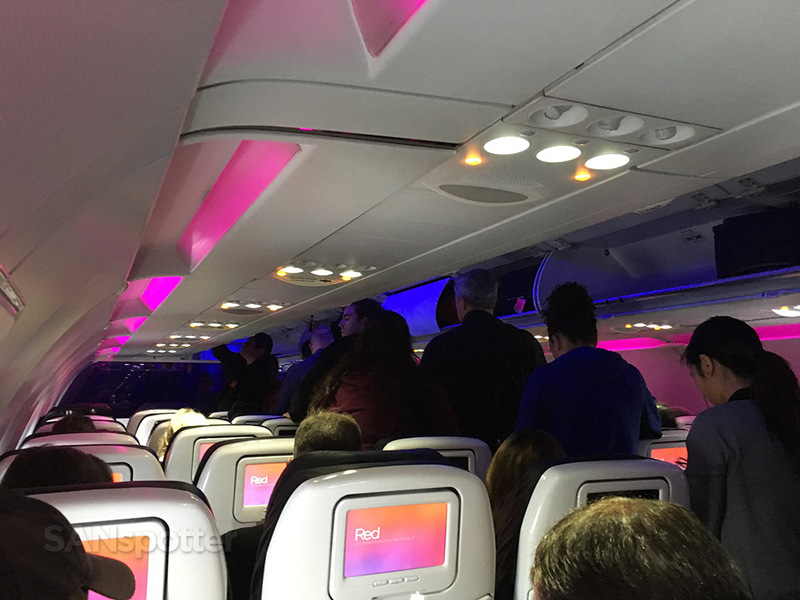 Unfortunately, although my seat on this flight down to SFO qualified as Main Cabin Select, it was just a standard exit row seat and not part of the premium economy section. 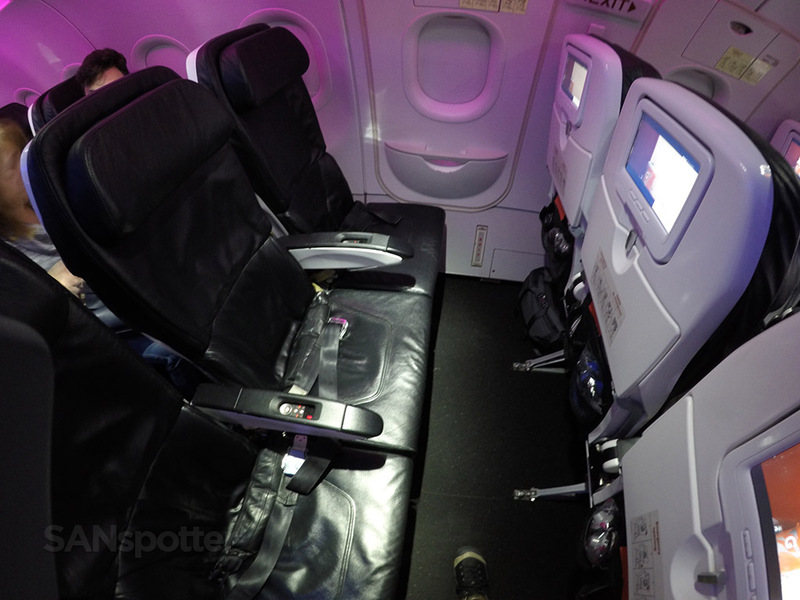 Speaking of the premium economy “section” on Virgin America aircraft, it simply consists of one row (row 3) at the very front of the main cabin. 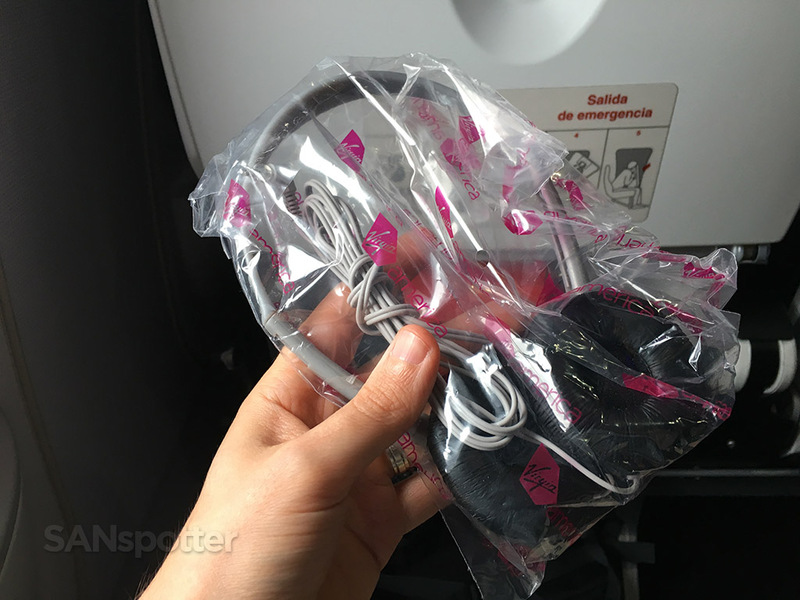 That pales in comparison so other US airlines which usually dedicate the first four or five rows to premium economy. Main Cabin Select exit row seats 10A, B, and C.
Lots of leg room here in the exit row, as expected. 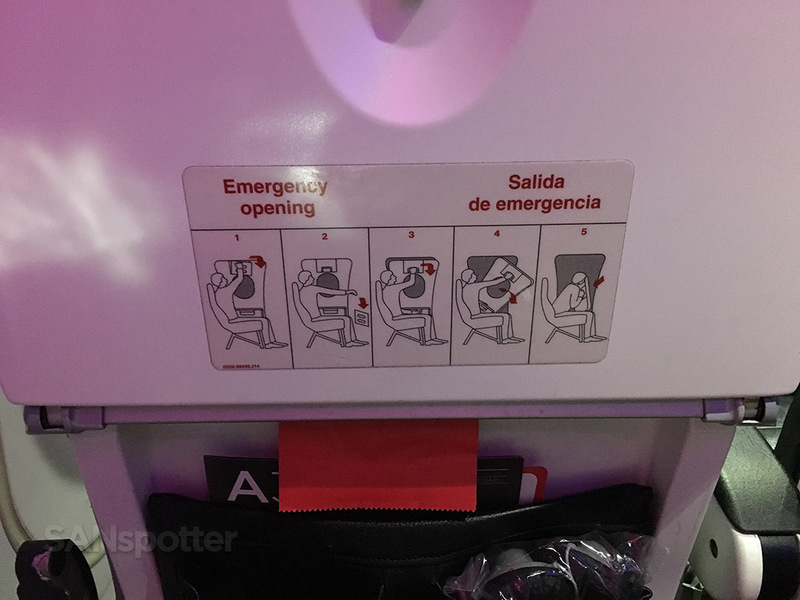 I’ve always wondered how well I would perform under pressure to open that door in an emergency. The instructions look simple, but what happens when you factor in the smoke, flames, and 120 people yelling at you to hurry the hell up? 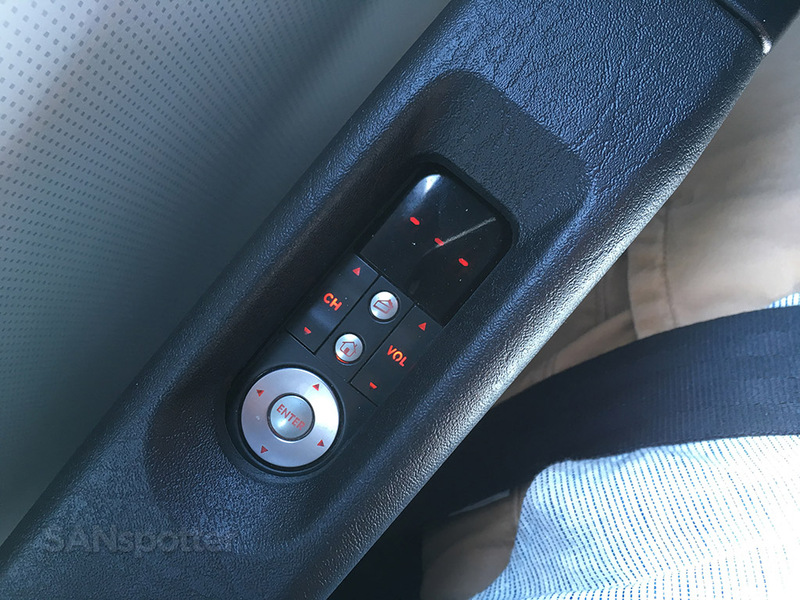 Removable remote control for the entertainment system (Red) integrated into the arm rest. 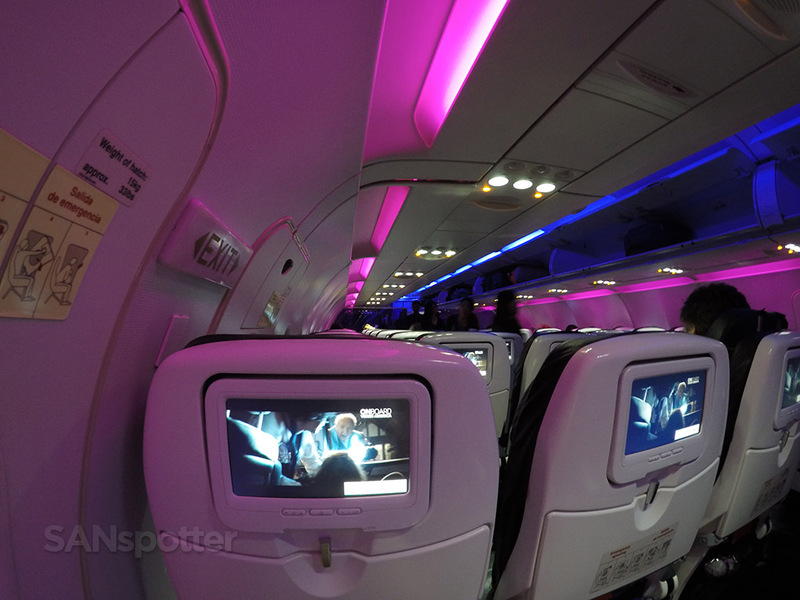 There’s nothing quite as nice as that Virgin America LED mood lighting. 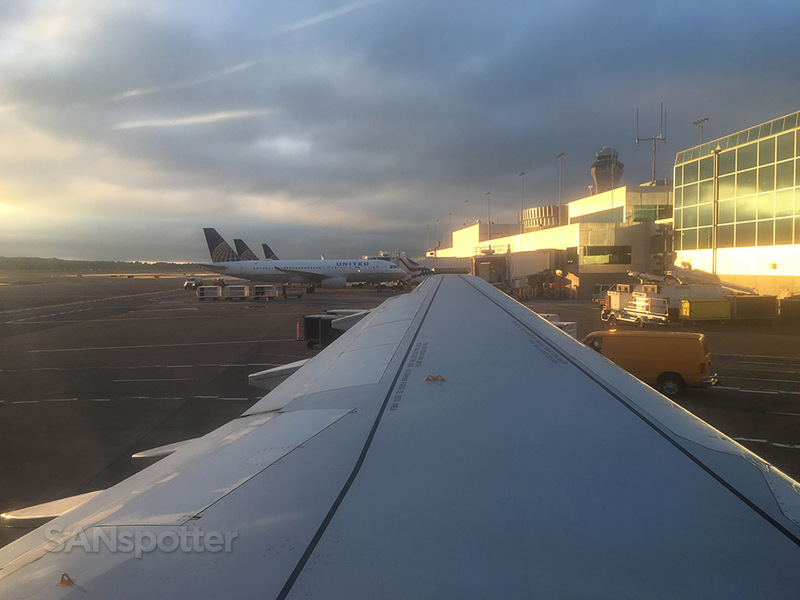 The sun was just starting to come up as everyone was coming onboard, and overall, the mood was quiet and somber as the plane filled up. It was just after 6am after all, so there weren’t many people in a chipper and lively mood yet this morning. I sure wasn’t. 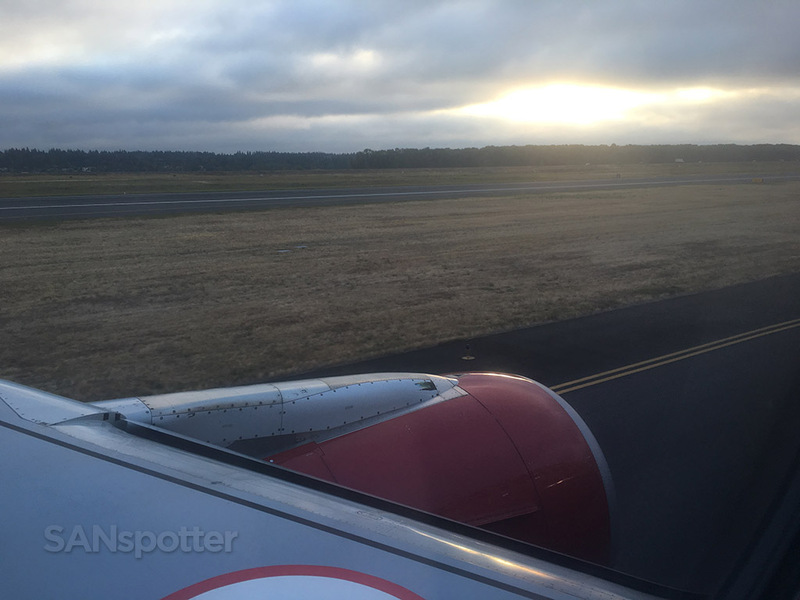 It was starting to look like a beautiful morning out there just before pushback. 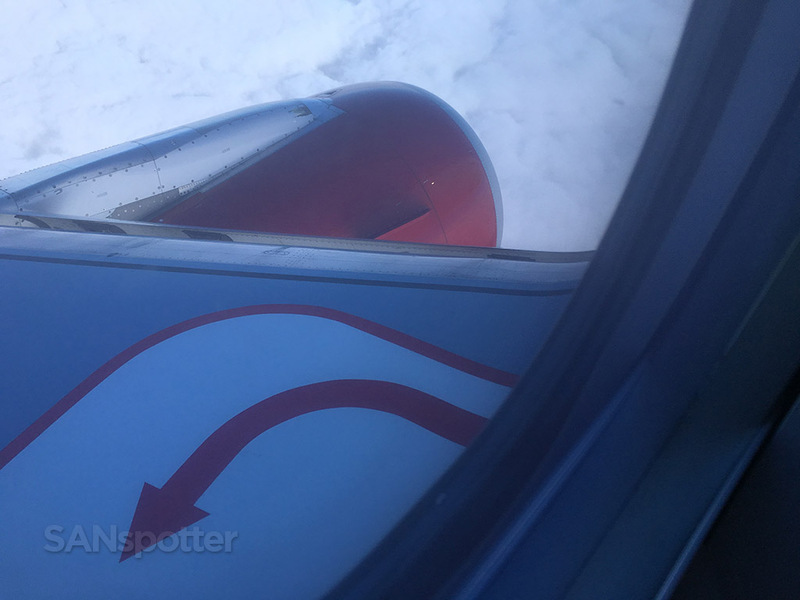 After a verbal confirmation to the flight attendant that yes, I was willing and able to help in the event of an emergency (a perk of sitting in an exit row), we pushed back from the gate and were on our way. 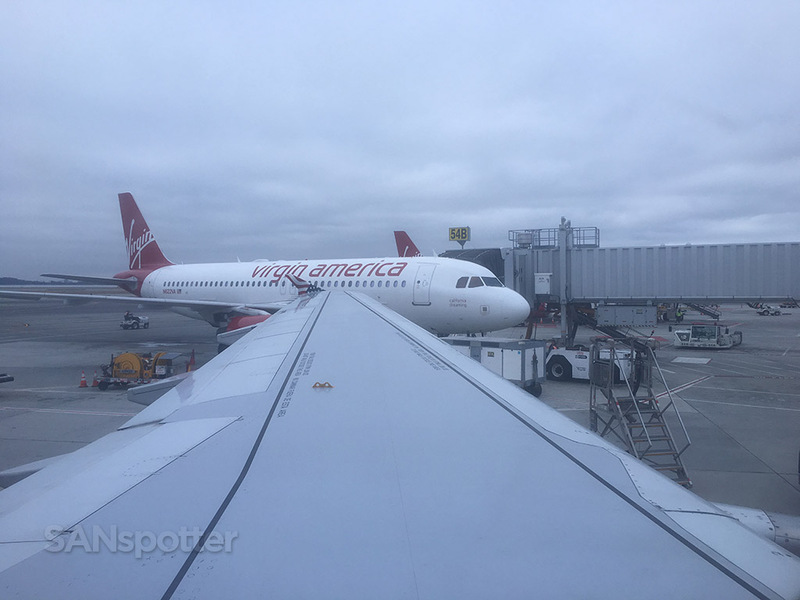 It’s been a long time since I’ve felt this groggy and tired on an airplane, and I’m amazed that I was able to function somewhat normally and take all the pics and video I needed for this trip report. 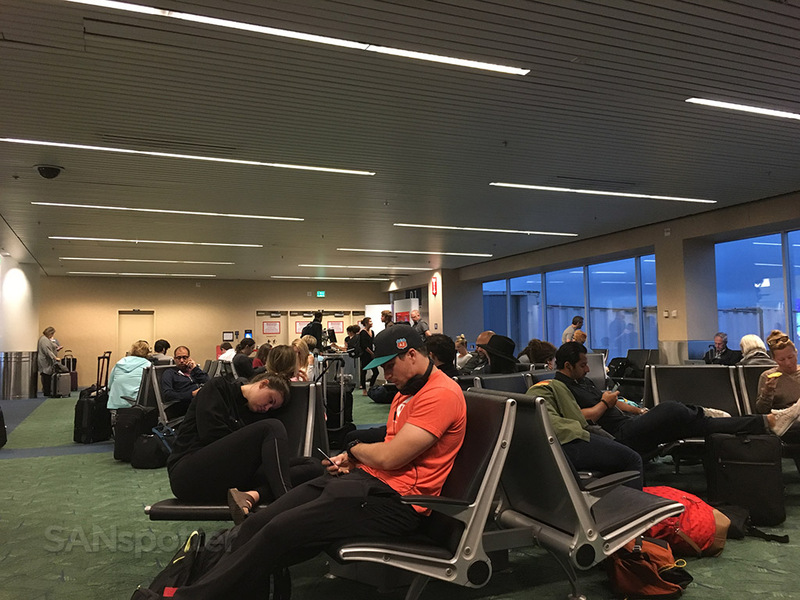 Mental note: avoid pre-7am flights like the plague from now on! The clouds were still pretty thick as we were taxiing out, and we only saw a few peeks of the sun. Liftoff! 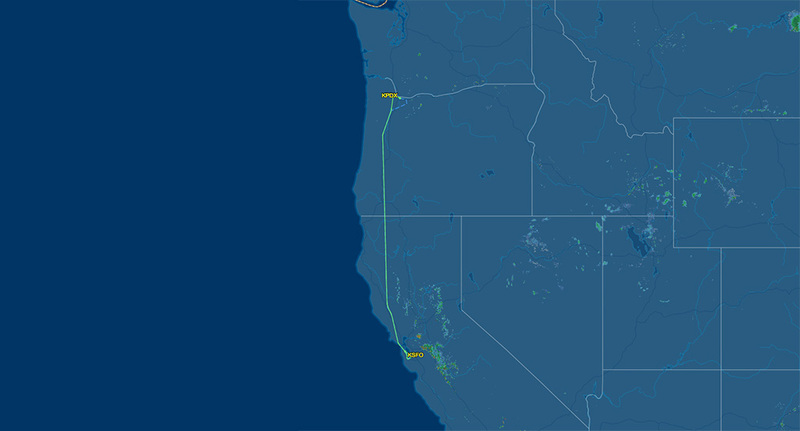 Truth be told, pre-7am takeoffs aren’t all that exciting. 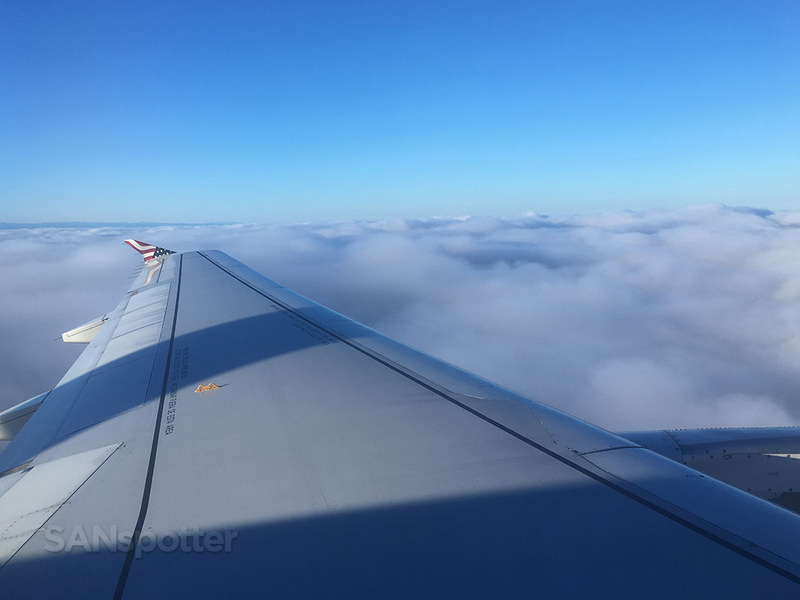 Thankfully it was bright and sunny above the clouds, which lifted my spirits quite nicely. 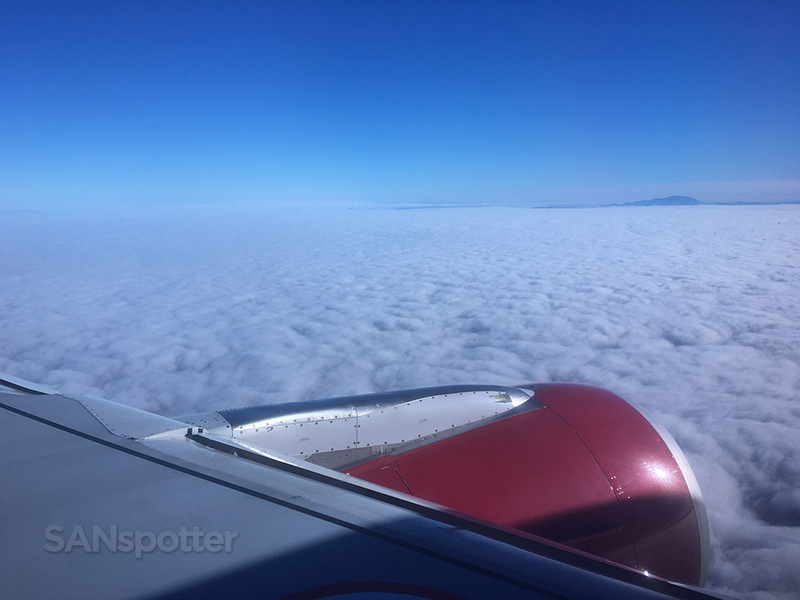 This was the view from the window as soon as we were pointed south towards SFO. No chance of decent photography now. 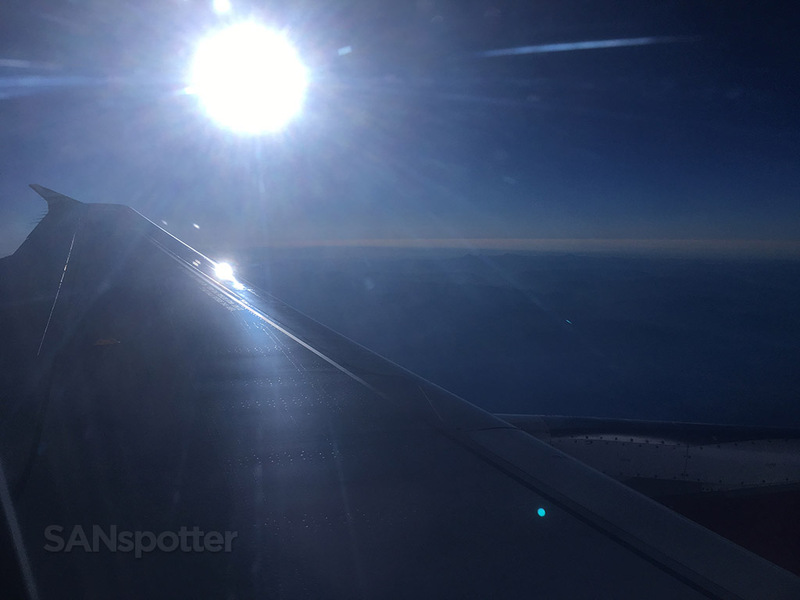 The rising sun just outside of my window proved to be too intense for such an early hour, and I left the window shade closed for most of the flight. 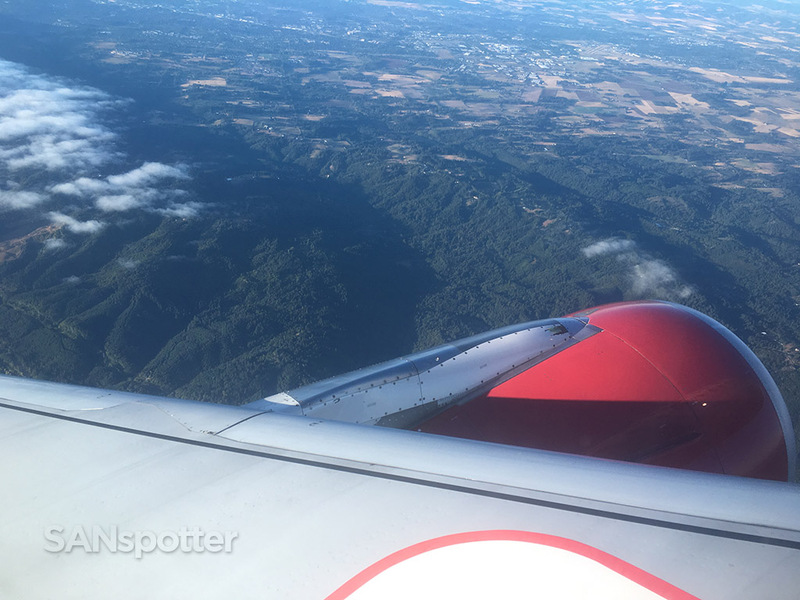 That’s pretty rare for me, as I’m usually the type of guy to have my nose glued to the window the entire time looking down on the world below in awe. Not today. 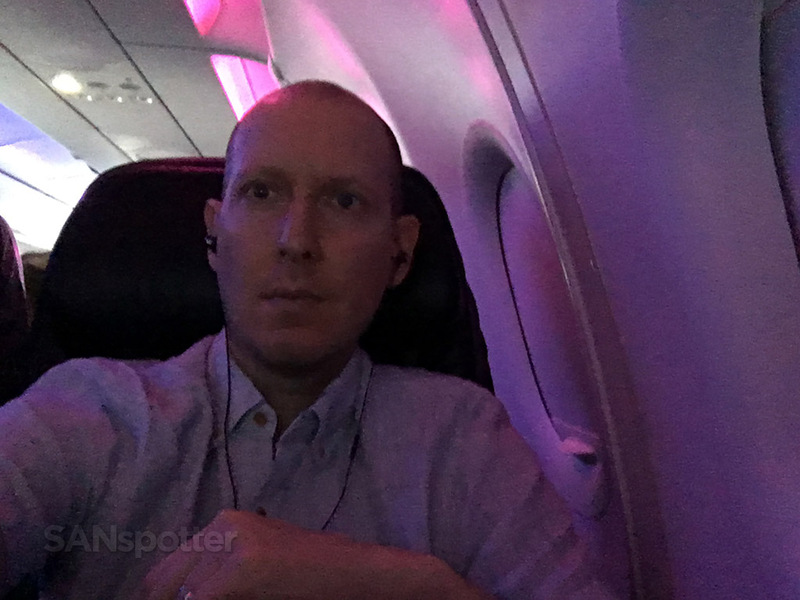 Most of the other window seat passengers had the same idea so the aircraft was pretty much dark all the way down to SFO this morning – except for that beautiful purple and pink glow from the LED mood lighting. It was the perfect opportunity to catch up on some much needed sleep. 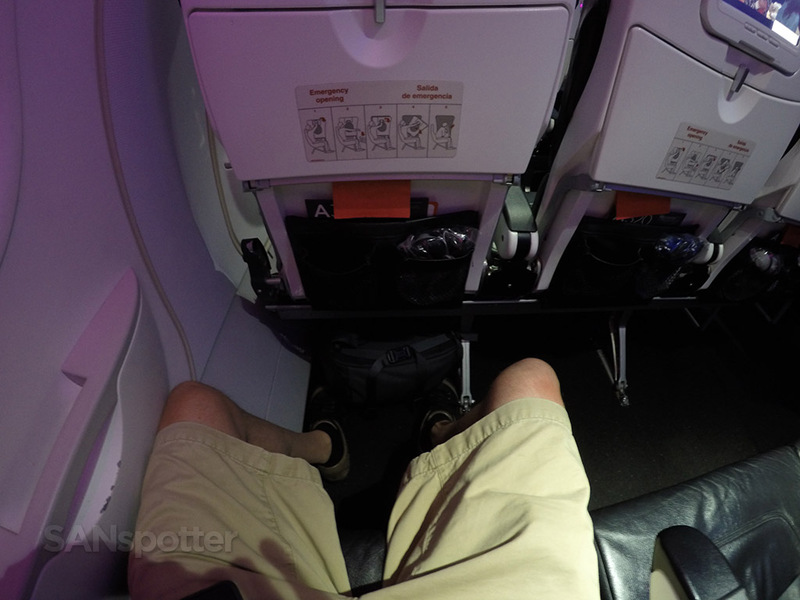 Sleeping in economy class seats isn’t easy, but I did the best I could. 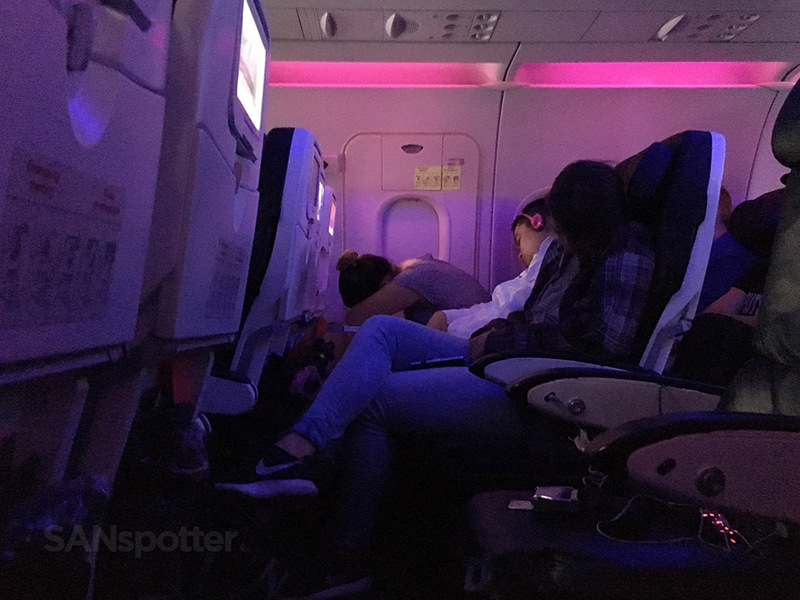 Other passengers sleeping hard all the way to SFO. It was completely dark in the cabin, though the sun was shining bright outside. 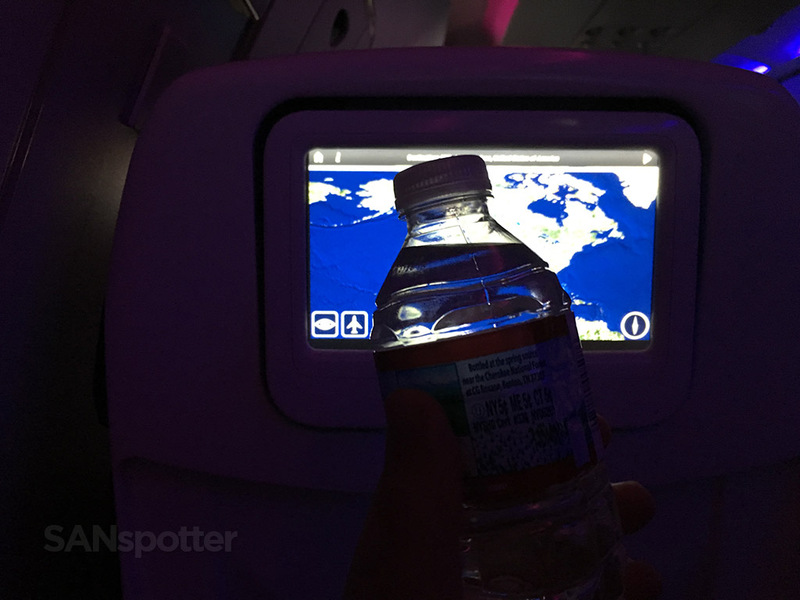 Here I am trying to take a pic of the bottle of water I received from the flight attendants doing their inflight beverage service. You could almost hear the gasps and when someone went rouge and pierced the darkness with an open window shade. 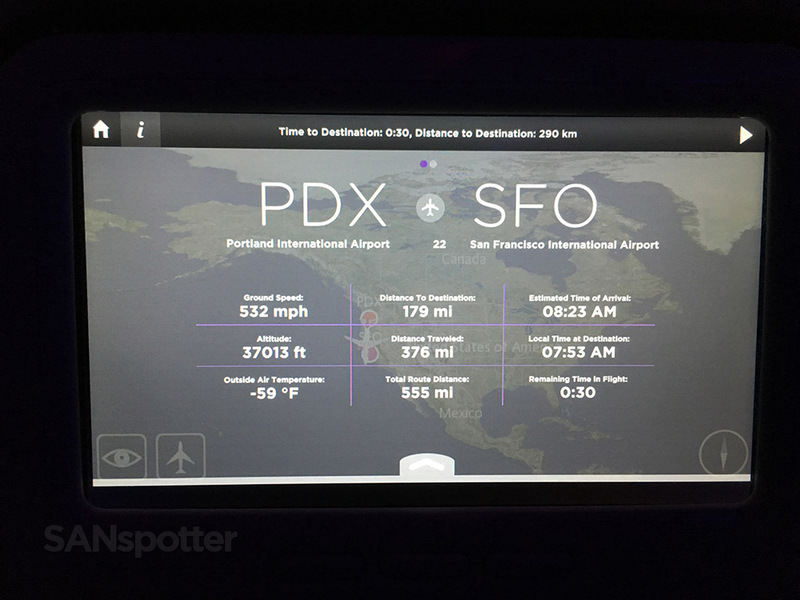 I love an inflight entertainment system that offers good progress report data! 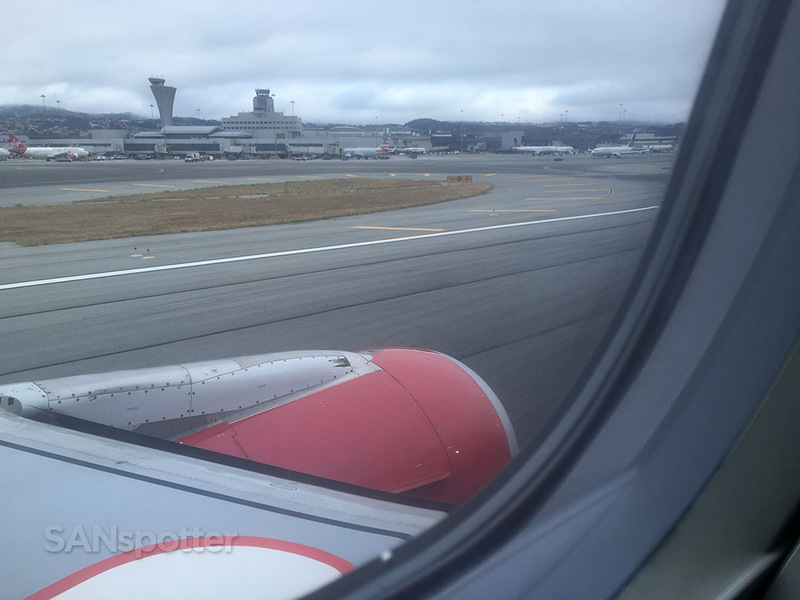 Our arrival into SFO was a twisty one – and I was really hoping for clear skies and a beautiful view of the city of San Francisco as we made our approach. 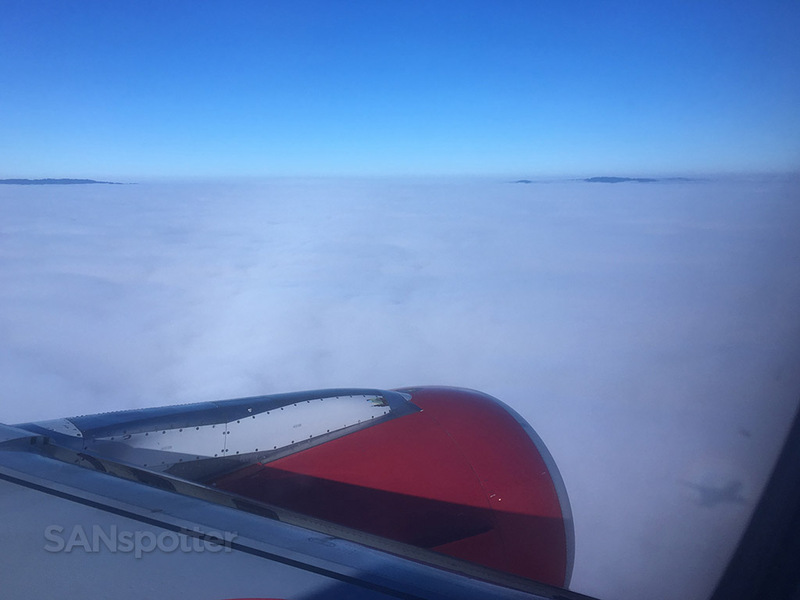 Descending into SFO – looks foggy down there. 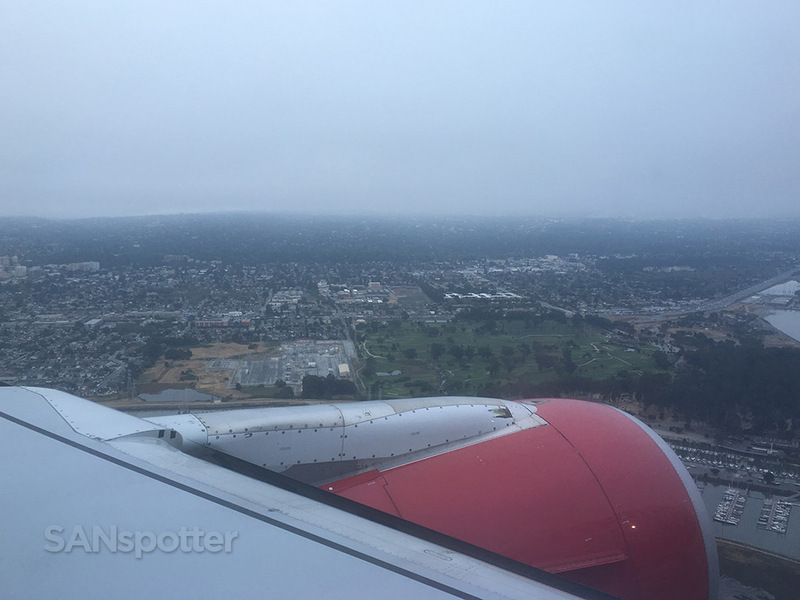 I hate overcast descents like this because it’s really hard to tell how close we are to actually landing. Can you spot our shadow? 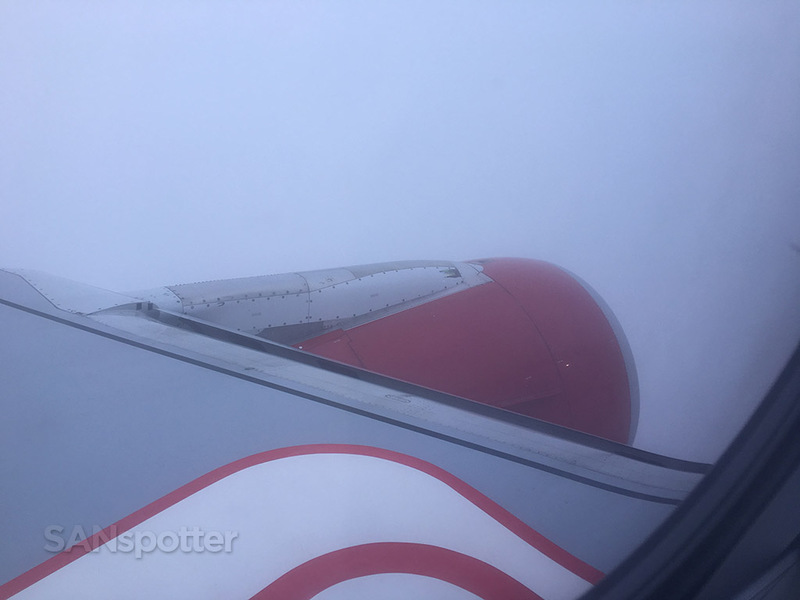 Unfortunately, the fog was too dense this morning and it was an overall gloomy and uneventful approach and landing on 28L. 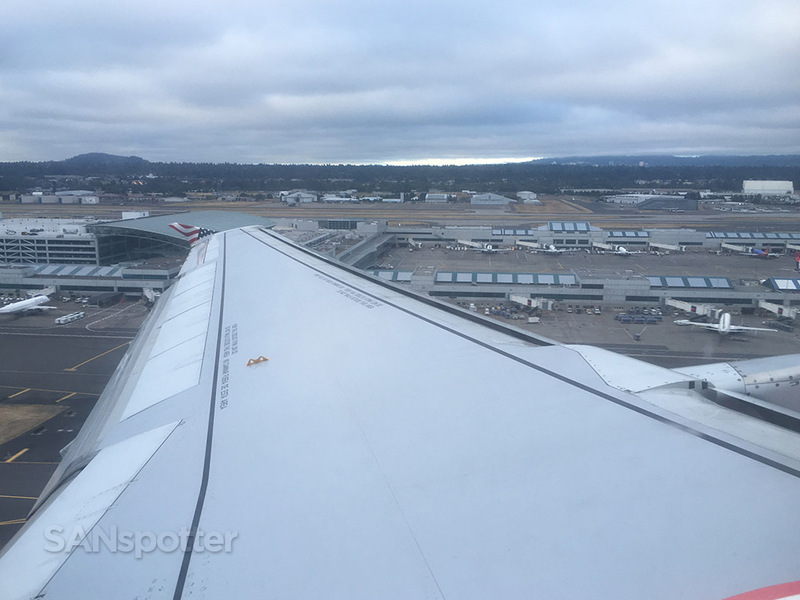 And come to think of it, nearly every time I’ve flown into SFO over the past few years has been clear and sunny which made this arrival seem wrong to me. The fog is perpetually brutal in this city, but it’s odd arriving under overcast conditions! Getting downright gloomy out there now. Below the cloud deck and all lined up with 28L. Not so many of the other passengers stood up while we waited to deplane. It’s too early for that kind of thing! I like your posts Scott!! I really do!! Not a frequent visitor though. Very specific and expert view but easy to melting into the story through your journey. Keep on doing this great job my friend!! Thank you for sharing these amazing experiences!! Okyoung! You found my blog! Haha…glad you like it. I’m not really sure why I enjoy documenting my trips like this, but I’ve always had a passion for documenting and archiving things. Love of travel + love of documentation = very detailed trip reports. 🙂 Hope you visit more often!